The economic recovery has continued to largely bypass low- and middle-income Californians, according to new Census data released last month. These latest Census figures show that California households in the bottom three-fifths of the income distribution saw their incomes essentially stagnate last year, even though the economy had been expanding for four straight years in California and nationally. The absence of any significant income gains is especially bad news given that these households suffered steep declines in their incomes in each of the prior five years. California households in the bottom fifth, whose incomes fall below about $23,600, fared the worst in recent years. Their average inflation-adjusted income dropped by about 19 percent between 2007 and 2012, then flat-lined in 2013. This means that the lowest-income state residents have yet to gain back any of the nearly $3,000 they lost, on average, due to the weak job market during and in the aftermath of the Great Recession. While sobering, this trend is not entirely surprising given that hourly wages stagnated or declined for low-earning workers throughout the recovery. High-income Californians also saw their incomes fall in recent years, but unlike state residents at the low end of the distribution, they regained in the last year much of what they had lost in prior years. The average inflation-adjusted income for households in the top fifth dropped by about 8 percent ($18,200) between 2007 and 2012, but then rose by about 4 percent ($9,500) in 2013. This means that in a single year the highest-income households — whose incomes averaged $224,000 — regained more than half of the income they lost, on average. The top 5 percent of California households — whose incomes averaged $399,000 — fared even better: Last year alone, they regained nearly two-thirds of the income they lost during the prior five years. As the benefits of recent years’ economic growth largely accrue to Californians at the top of the distribution, income gaps are widening, exacerbating already high levels of inequality in the state. Last year, the average household in the top 5 percent had an income of $399,000 — 31 times the income of the average household in the bottom fifth ($12,700). Just six years earlier, at the height of the housing boom, the average household in the top 5 percent earned 26 times as much as the average household in the bottom fifth. This widening divide means that nearly one-quarter of total household income now goes to the wealthiest 5 percent of Californians, while less than 3 percent goes to the bottom fifth. 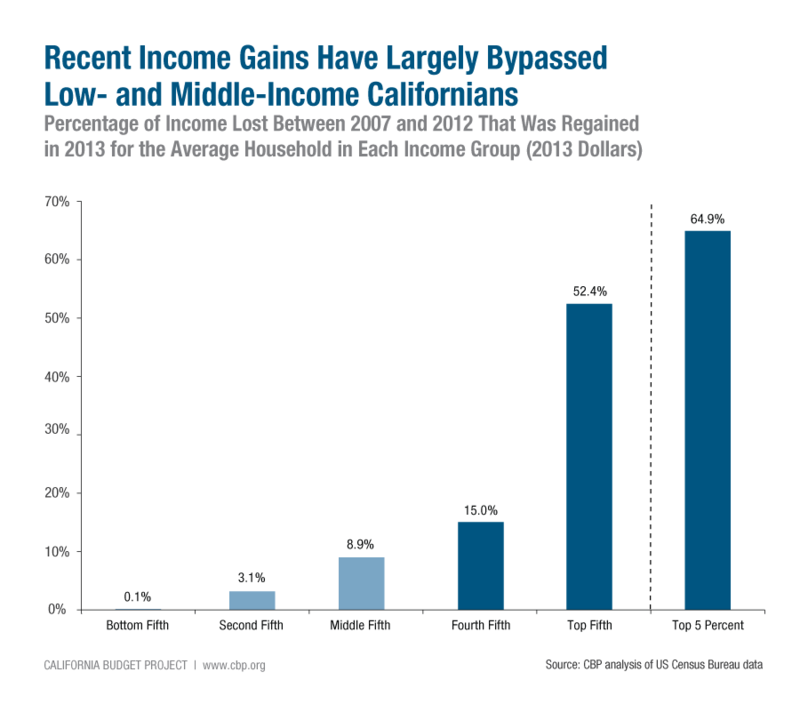 And as striking as these figures are, they actually understate the extent of inequality in California. This is because they exclude one of the most significant sources of income for the wealthy — capital gains — and also because the Census does not report income changes for most millionaires. Should we be concerned that our nation’s economic rebound isn’t translating into income gains for a broad swath of the population? Certainly if you’re among the majority of families who have yet to see their incomes rise after years of decline, you have good reason to be concerned. As one recent New York Times analysis put it: “You can’t eat G.D.P. You can’t live in a rising stock market. You can’t give your kids a better life because your company’s C.E.O. was able to give himself a big raise.” In other words, without broadly shared income growth, an expanding economy can do little to help most families be economically secure or move up the economic ladder. But there’s another reason we should be worried about uneven income gains. Recent reports, including one by Standard and Poor’s (S&P) Financial Services, have suggested that income inequality could be holding back our nation’s economic growth. One explanation could be that when many people’s incomes don’t keep up with their expenses, they often spend less. And when large numbers of people spend less, businesses produce less. The end result: an economy that grows more slowly than it otherwise would if fewer families were struggling to pay their bills. But now for some good news: Inequality is not inevitable. As Nobel Prize-winning economist Joseph Stiglitz recently wrote, “widening and deepening inequality is not driven by immutable economic laws, but by laws we have written ourselves.” That means policymakers have the tools to reduce our growing income divide and mitigate the hardship it inflicts on low- and middle-income families. One way state policymakers could do this is by making investments to ensure that all children have sufficient opportunities to move up the economic ladder. Increasing access to high-quality education, from preschool through college, for example, would set low-income children on a path toward greater economic security in the future. State policymakers could also take steps to make California’s income tax system more progressive. Creating a state Earned Income Tax Credit (EITC), for instance, would not only help workers with low to moderate earnings better support their families, but it also would reduce after-tax income gaps. To learn more about how California could reduce inequality by establishing a state EITC, watch for our forthcoming publication on the topic. The latest issue of Stanford University’s Pathways, a magazine featuring articles about poverty, inequality, and social policy, perfectly echoes a number of the key messages in our recent report, Five Facts Everyone Should Know About Poverty. An article by Marianne Page, deputy director of the Center for Poverty Research at UC Davis, for example, calls into question the “common mantra [that] the only enduring solutions to poverty are economic growth and the jobs it delivers.” Page shows that economic expansions reduce poverty less than they did in the past partly because a growing share of the new jobs pay low wages. Similarly, our Five Facts report shows that poverty in California is more often due to low-wage work than to a lack of employment. Like Page, we argue that reducing poverty will take policies that boost workers’ earnings, such as continuing to increase the state’s minimum wage and establishing a state Earned Income Tax Credit (EITC). The effects of EITC extend well beyond simple income support and poverty reduction. … It leads to various improvements in the mental and physical health of mothers. It brings about a reduction in low birth weight among infants. And it improves the performance of children on cognitive tests. This burgeoning body of work suggests, then, that income support programs have benefits that extend well beyond an increase in cash flow for families in poverty. With evidence like that, it’s no wonder that half of all states have created their own EITCs to further leverage the benefits of the federal credit. And it’s why California should do the same. Poverty is a problem state policymakers can address if they choose to prioritize investments in proven strategies. Many families across California struggle to cover the costs of housing, child care, and other necessities, according to a new CBP study released today. This analysis underscores the need for targeted public policies that help boost workers’ earnings and that help Californians pay rent or buy a home, afford child care, and cover other basic family costs. Making Ends Meet: How Much Does It Cost to Raise a Family in California? looks at the income needed to support a family with two children or to live as a single adult in California, allowing only for basic expenses: housing and utilities, child care, health care, food, transportation, and other necessities. The CBP’s analysis finds that for a California family of four with two children and one working parent, it would take — on average — an annual income of $60,771 to afford a modest standard of living. This is equal to an hourly wage of $29.22 for full-time work, which far exceeds the statewide median hourly wage of $19.07 in 2012 and is well above the state minimum wage. As part of this report, the CBP has launched an online family budget calculator that presents estimated budgets for four family types in all 58 counties. Also available online are fact sheets that provide the estimated family budgets by county and at the state level. A lack of affordable housing in California. High housing costs in California present a major hurdle for many individuals and families. In 2012, nearly one-third of households (30.5 percent) spent at least half of their income on rent. In addition, from 2010 to 2012, California’s homeownership rate was the second-lowest of all states, averaging 54.9 percent. High child care costs. The CBP’s analysis estimates that child care costs in California average more than $1,100 a month for families with two children. State policymakers have cut support for child care and state preschool in recent years. Between 2007-08 and 2013-14, combined funding for California’s child care and state preschool programs fell by nearly 40 percent, after adjusting for inflation, resulting in the loss of 110,000 funded “slots” in these programs. Rising family health care costs — which implementation of federal health care reform will help address. The cost of health coverage has risen sharply over the last decade in California — increasing at roughly five times the rate of inflation between 2002 and 2012. Statewide, the monthly cost of health care — including insurance premiums and out-of-pocket costs — averages nearly $500 for an individual and slightly more than $1,400 for a two-parent family with two children, according to CBP estimates. In many California counties, health care costs are the largest single expenditure in the basic family budget. Beginning next year, subsidies provided by the federal Affordable Care Act will lower insurance costs for certain families who purchase their own health coverage. The Making Ends Meet report — including the online family budget calculator — is available at www.cbp.org/MakingEndsMeet. As we blogged about, the University of California, Berkeley’s Institute for Research on Labor and Employment (IRLE) last month released a major report on the social and economic costs resulting from low-wage work in the fast-food industry. Yesterday in Sacramento, the Assembly Labor and Employment Committee and the Senate Labor and Industrial Relations Committee held a joint informational hearing on fast-food industry employment and the policy challenges presented by low-wage work. CBP Policy Analyst Luke Reidenbach led off the meeting with invited testimony on California’s current job market and what the latest wage and employment trends mean for the state’s residents. Luke’s remarks were based on his analysis in a recent CBP report — Uneven Progress: What the Economic Recovery Has Meant for California’s Workers — and highlighted the fact that recent job growth has not translated into wage gains for many workers. If economic growth were broad-based, workers across the wage distribution would be seeing real gains in their wages. However, so far in this recovery only high-wage workers — which we define as those falling into the top 20 percent — have seen any significant wage gains over the last few years. To further assess how well California’s economy is working for families across the state, the CBP later this year will release an analysis of what it takes to make ends meet in California, including a look at how typical wages stack up to the costs of basic necessities. Earlier this week, we released our annual Labor Day report, taking a look at the latest employment and wage trends, what they mean for workers and their families, and some key implications for public policy. This new report shows that even after more than three years of job gains, California’s recovery from the Great Recession thus far has left many workers behind. Even after three years of job growth, California has about 600,000 fewer jobs than it did prior to the recession, and unemployment remains high in many parts of the state. During the first half of 2013, most California counties — 34 out of 58 ­— had an average unemployment rate in the double digits. The share of unemployed Californians who have been seeking work for six months or longer is down only slightly from a record high and stands at 43.1 percent. In other words, more than two out of five unemployed Californians have been looking for a job for at least half a year. What’s more, many workers who do have jobs are unable to obtain full-time employment. Involuntary part-time employment — when workers cannot obtain a full-time schedule even though they want one — is currently a reality for more than 1.3 million workers, or 8.0 percent of all employed Californians. Compared to prior recoveries in California, the current recovery is more heavily reliant on service industry growth that typically pays lower wages. For example, the leisure and hospitality industry accounted for nearly one-quarter (24.4 percent) of total job growth between February 2010 and June 2013, a much larger contribution than this industry had made to earlier economic recoveries. Due to recent gains, high-wage workers — those at the 80th percentile of California’s earnings distribution — have seen inflation-adjusted hourly earnings nearly return to their 2006 level. Meanwhile, inflation-adjusted wages of low-wage workers (those at the 20th percentile) remain 5.9 percent below their pre-recession level, while those for mid-wage workers (with earnings exactly in the middle of the distribution) are 3.8 percent below the pre-recession level. Uneven Progress highlights the importance of state policymakers taking actions to support workers and their families and foster broadly shared prosperity over the long term. These include raising the minimum wage, boosting support for child care and the CalWORKs Program, and reinvesting in education across the spectrum — early education, K-12 schools, and colleges and universities. In the coming weeks, the CBP will issue additional analyses on California’s job market recovery and how the state’s workers and their families are faring. Stay tuned to this blog and our website, and be sure to join our email list to receive all the latest updates.